Wake Island dodged a bullet earlier this month. On July 11 a tropical storm formed south of Hawaii near Johnston Atoll and rapidly gained strength as it tracked west toward Wake. The storm packed typhoon-force winds as it approached the atoll and predictions called for a close pass on July 16, prompting a Tropical Cyclone Condition of Readiness 2 on Wake. On July 15 Hawaii Air National Guard evacuated all Wake base personnel to Anderson AFB on Guam via C-17 Globemaster aircraft to wait out Typhoon Halola. The Stars and Stripes website offered daily Pacific Storm Tracker updates on the typhoon’s progress, thanks to “typhoon chaser” Dave Ornaur. By noon on July 16 (Wake time) Halola was passing sixty miles south of Wake with sustained winds of 86 mph and gusts over 100 mph at the center. The compact storm, tightly concentrated around the center, extended typhoon-force winds some 35 miles north and tropical storm-force winds 120 miles out. In the late afternoon the west-northwest tracking storm shifted and approached closer to Wake with expected sustained wind speeds of 40 mph and gusts near 60. Nobody was home to tell how it went down. Once they cleared the runway for landing a small team of the 36th Contingency Response Group and explosive ordnance disposal experts followed up. An airfield pavement evaluation team surveyed the 10,000-foot runway for damage, drilled test holes to check under the asphalt, and cleared the runway for landing. The C-17 brought Wake’s USAF detachment (Detachment 1, PACAF Regional Support Center, formerly known as the 611th ASG, out of Joint Base Elmendorf-Richardson), base ops personnel and additional assistance, as well as pallets of drinking water and other supplies. In short order power generation and food and water operations were brought on line: Wake was back up and running. My source on Wake, who had been on the mainland during the typhoon, returned to Wake a few days ago and his early report indicates only moderate damage, with some broken windows and rock-strewn areas. After sweeping over Wake Island, Halola weakened as it pressed on northwestward toward Iwo Jima, then gained typhoon strength again as it approached Okinawa, where U. S. military bases were on storm watch. Downgraded again to tropical storm status, in finally passed twenty miles east of Sasebo, Japan on July 26 and petered out. After sixty Halola updates at his Pacific Storm Tracker post, Mr. Ornauer was probably glad to hang up his pencil. He noted that three-week-old Halola was the longest lasting and longest distance Pacific typhoon since Super Typhoon Ioke, which tore through the Pacific in August and September 2006. Packing 150 mph winds, Ioke made a direct hit on Wake on August 31, 2006, causing catastrophic damage, though the entire population of 188 was evacuated, this time to Hawaii. With damage in excess of $80 million, 70 percent of the buildings were impacted, though major infrastructure survived, including the airfield. During my visit in 2011 storm damage from Ioke was still visible on buildings and many facilities were never rebuilt. Wake is often hit by storm surges and rogue waves that cause considerable damage as everything sits at sea level on Wake. Reaching back through Wake’s short recorded history, we see typhoons finding Wake Island with some regularity: Freda in March 1981 with 75 mph winds, damage to much of the runway, and destruction of a new $7 million seawall; Sarah in September 1967, when Wake occupants evacuated to Hawaii while winds of 112 mph damaged 95% of the structures; and Olive in September 1952 packing winds up to 180 mph. 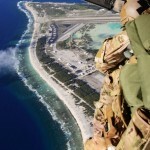 On a low-profile atoll like Wake there is little protection from Mother Nature. In my research the earliest survey map of Wake Island from 1935 (Building for War, xiv-xv) clearly indicates where storm water washes across the island and areas of inundation. Prior to construction by Pan American and the navy contractors, huge coral boulders thrown by the surging sea studded the beaches. I open Chapter 1 of my book with a typhoon “boiling up out of the western Pacific, a furious marriage of wind and water bearing down on the tiny toehold of land in its path,” pummeling Wake Island on October 19, 1940, as the Pan American employees hunkered down in their little compound on Peale. As of July 28, 2015, the National Weather Service Forecast Office at Guam says “no active tropical cyclones at this time.” All is quiet on the Western Front . . . for now.